I found a cute as can be orange folding chair at the Nashville Flea Market this past weekend but my favorite find came from an estate sale. Just wait until you see it. 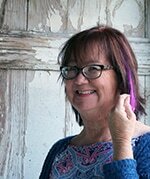 I met my friend Angie, Post Cards From The Ridge, at the market on Saturday and we had a fun girls day. Angie lives in Oak Ridge and we don’t get to visit very often. I’m happy she made the drive! This is the cute little orange folding chair. I saw it and just had to have it. You guys know orange is my downfall….along with green, yellow, red….you get the drift. I think the chair will show up in my Fall porch décor. The price was $10. How about the turquoise ice cream bucket? At $49 it was way over my budget. The buckets make great flower containers. The colorful handmade quilts caught my eye too. 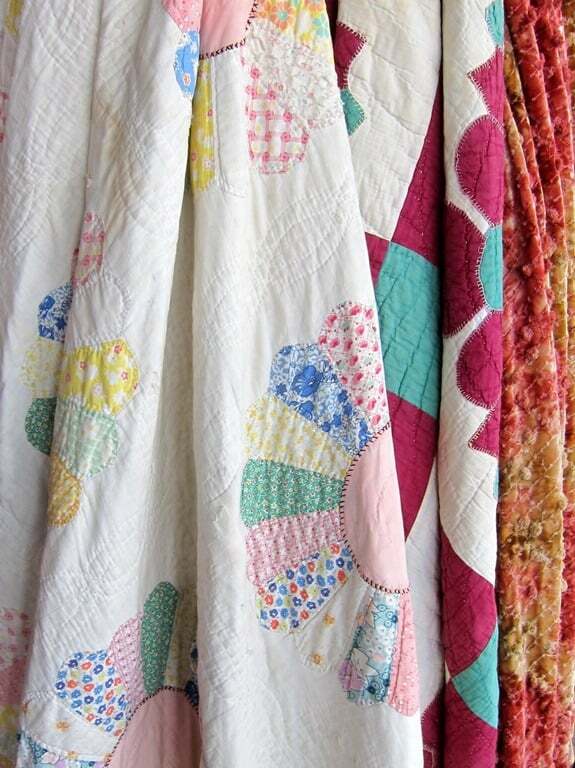 I have a large collection of quilts but only buy when the price is right and I can’t walk away. 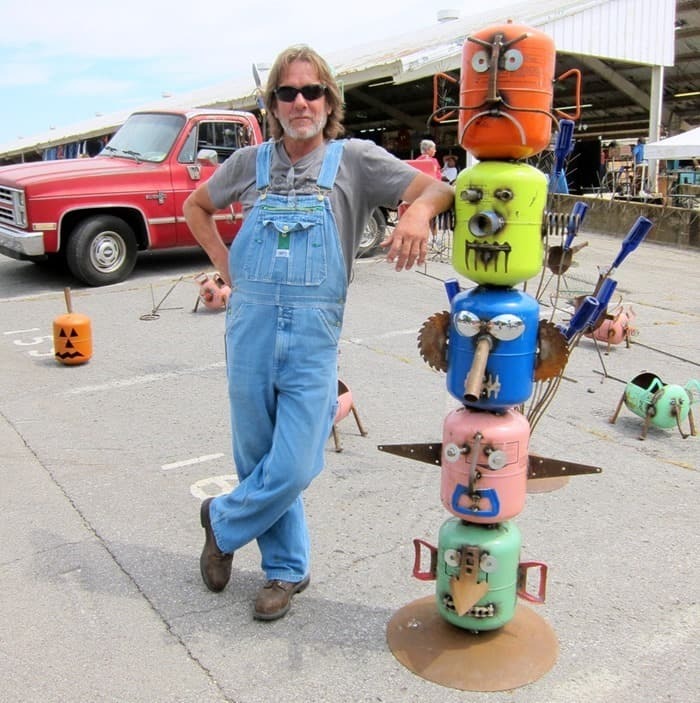 One of my favorite flea market vendors is Jimbo from Bradley Metal Works. He makes cool yard art and always has a smile on his face. He likes to pose for my photos. Cute scooter and other rusty stuff. I was hoping to pick up a few pots of mums at the market but there wasn’t a one in sight. I bought the orange vase. Isn’t it pretty. I don’t know the age but I’m guessing it’s from the ‘60’s? Heck, it could be new. I like it. 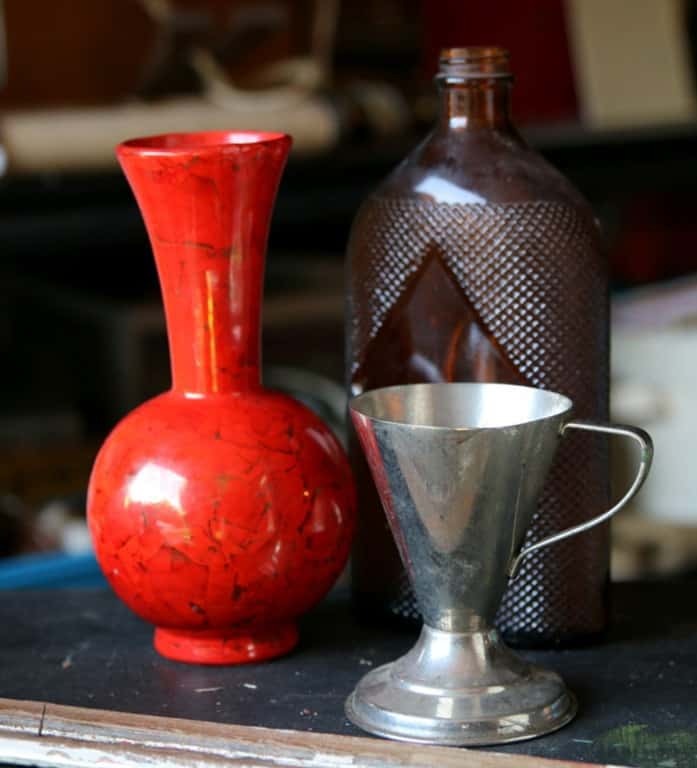 The brown bottle might get white paint and heavy distressing and the silver plated cup will get flowers or pumpkins or Christmas ornaments, or whatever. 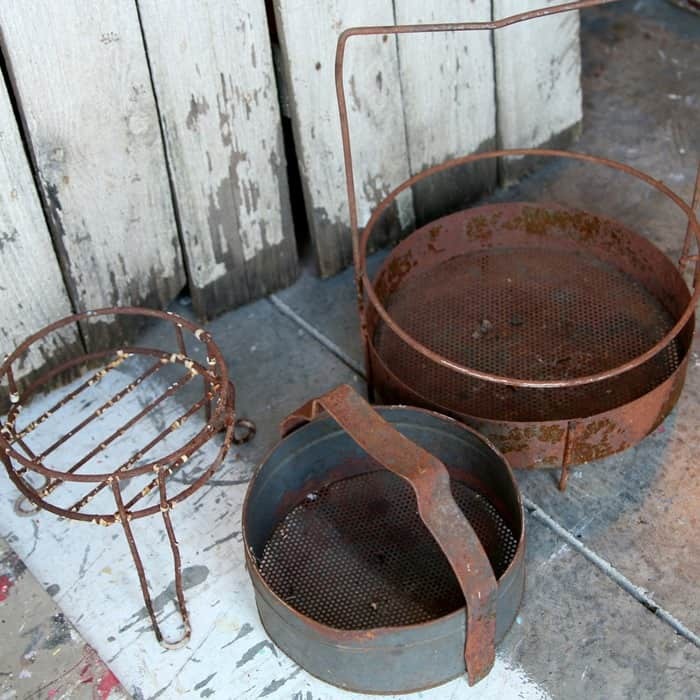 I also got the three rusty pieces. Maybe use them in my Fall décor too. Does it sound like I’m looking forward to Fall (insert Kathy smiley face)? Fall is my favorite time of year and yes I’m ready to move into Fall. I don’t usually go to estate sales because stuff is too pricey. This sale was in Nashville not too far from the flea market so I stopped in. 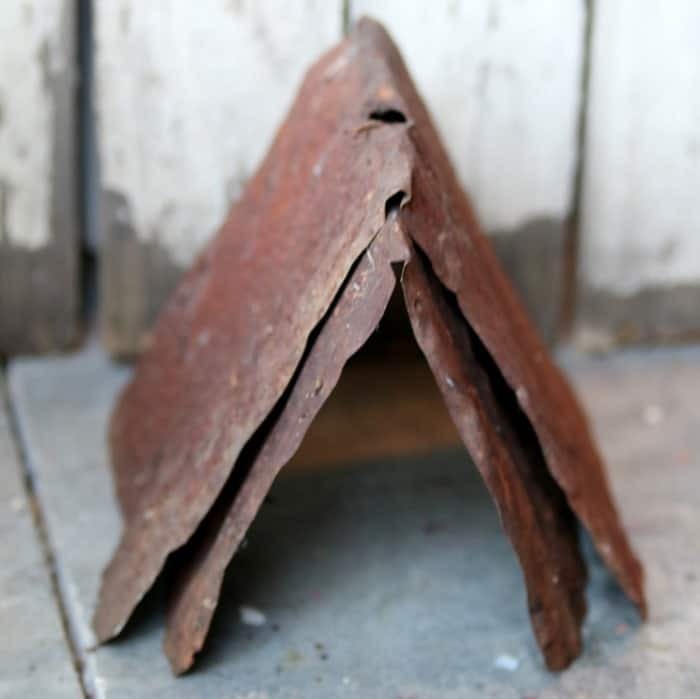 I found the rusty tin bird house roofs for $2. 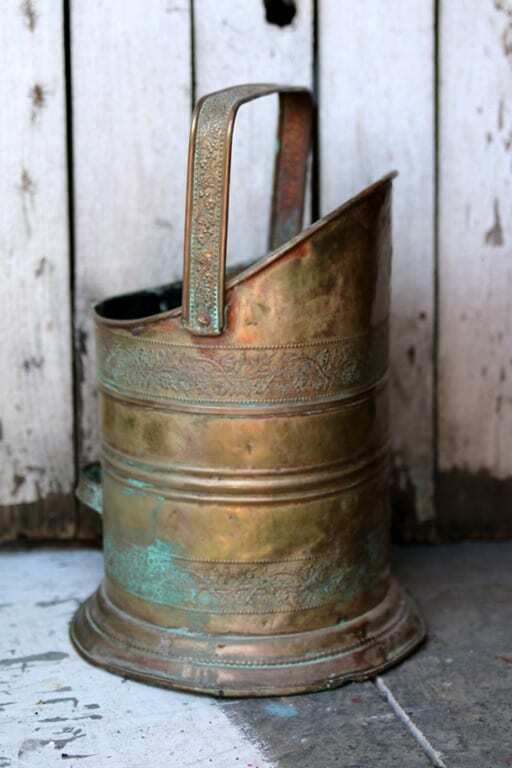 This is my favorite buy from the estate sale, a copper coal scuttle. I’m not sure if it is brass or copper. At first I thought it was brass but now not so sure. I read up on the metals and found that brass does contain copper….so I still don’t know. And even though I’m calling it a coal scuttle I’m not even sure that’s what it is. The house where the estate sale was held is about 90 years old. 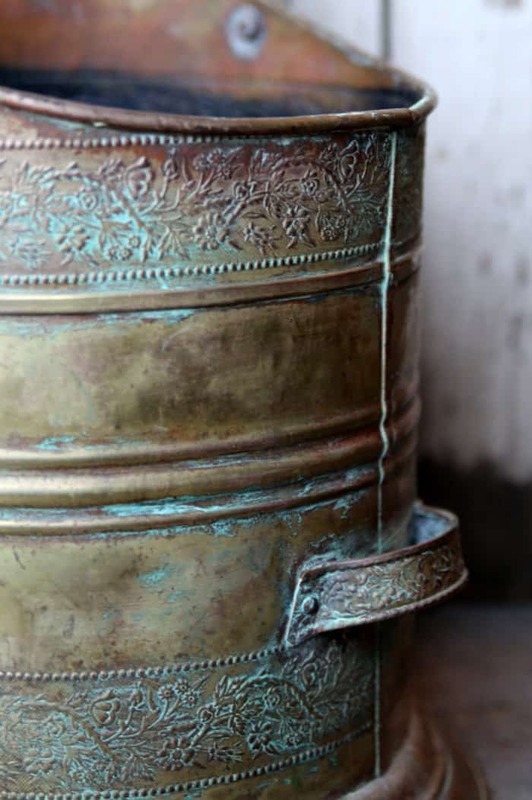 The “coal scuttle” has been repaired on the bottom and it has seen better days but that patina, wow. I love the punched details too. That’s it for my market finds. My friend Angie who shopped with me at the market has opened an online home décor shop. She has the coolest stuff. 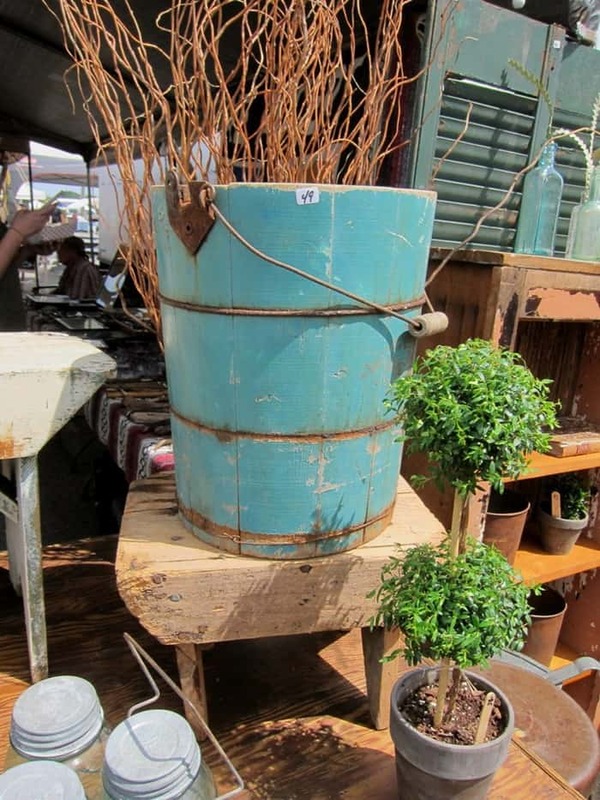 I’m thinking of ordering this vintage style metal bird feeder…..
or this two tier metal tray…. 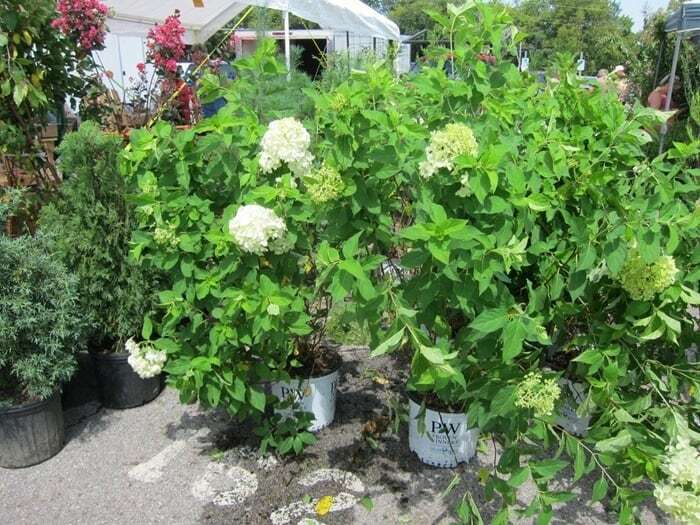 I think either one would look pretty with a nice Fall display, maybe some white pumpkins and greenery? What did you guys like best from the flea market photos? Leave me a note and be sure to be here tomorrow. Furniture reveal and it’s a doozy. Have a great day! Love chairs, don’t care! Great find! And your idea for silver containers for decor is very cool. Like the tiered tray and coal scuttle. I picked up two pie? tins with fluted edges that would be a great project, but not sure what. They naturally look like perfect sunflowers, but am holding off and hope to think of something else to do with them. Not sure what and check out your emails for inspiration. Love Fall, too. And have been planning for it since Spring with a road sign that was a Samuel Adams display from last Fall and container plants combo (purple grass in orange pots). Last Fall I put white sand in several Ball jars, added a tea light and tied each jar with burlap string for the front porch rails. Wonderful evening glow! Thanks for the shopping trip trip. I have not been “treasure hunting” at all this year! We have had a very unusually hot summer and no one wants to go out much in it. I like the bucket as well. Keep hunting! I loved the orange chair, the rusty stuff, and the metal birdhouse roofs (I live on 3 acres and have tons of birdhouses. I am also looking for new ones because eventually the weather does them in.) 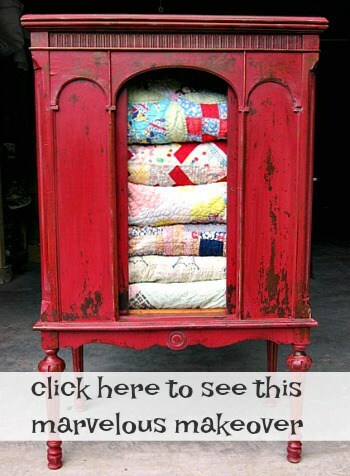 I am dying to go to the Nashville Flea Market but it will have to be in cooler weather. I absolutely love fall. My birthday is in October and the fair always came to Jacksonville (FL) in October. Also, I went to a great elementary school and my parents were involved and we always had great Halloween carnivals back then – in October. In addition to the weather starting to cool off, I had these other things that made me love the month of October – always said it was my favorite. My very first grandchild was born in October and I was so excited to share the month with her. I love Fall too. It is my favorite season. I remember Halloween carnivals. Too bad they don’t have those anymore. I looked forward to it every year at school. I hope you make it to the flea market! For me, rust, rust, rust! Love it! Although, the coal shuttle was so awesome due to that to die for patina. Great shopping trip, I’m jealous of all the East Coast flea markets, on our coast it’s rather blah. Maybe one day you can make it to Nashville! The orange chair is my favorite, although that two tier metal tray is right behind it. I would have snatched up that orange vase too! I have orange in my kitchen,even my kitchenaid stand mixer. The orange chair is staying as is. Perfect. Very sure that is a coal bucket even though we don’t have them here in Ca. I recognized it at once. And isn’t that brown jug an old purex bleach bottle? Love some of the rust stuff also. 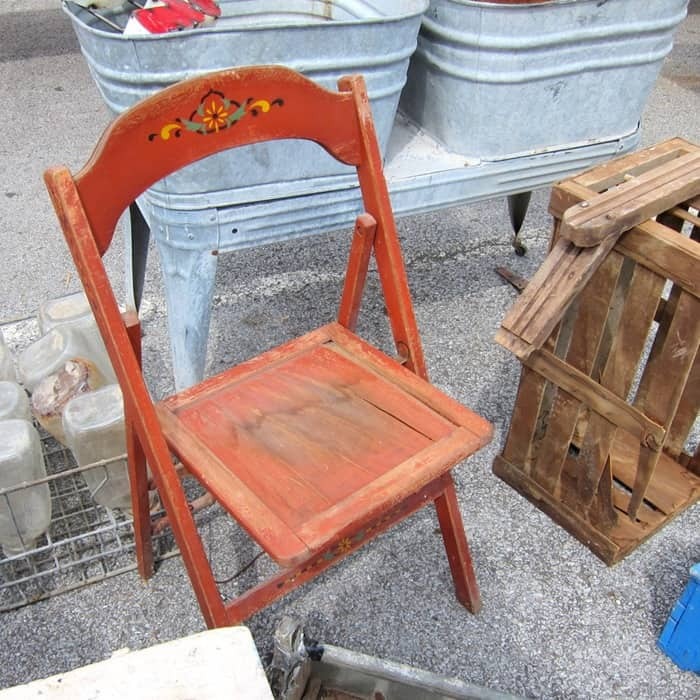 Love the paint decoration on the folding chair-too bad it’s orange-not a color for me. The orange chair!!!! I think we might have had a fight over it! Did give me an idea though … find one and paint it, with the little flowers of course. You really scored big time at this market! My favorite is the coal scuttle. I live in Wisconsin and we have a huge flea market coming up soon. Can’t wait, after seeing all your great finds. You love the same stuff I do! Good shopping ! 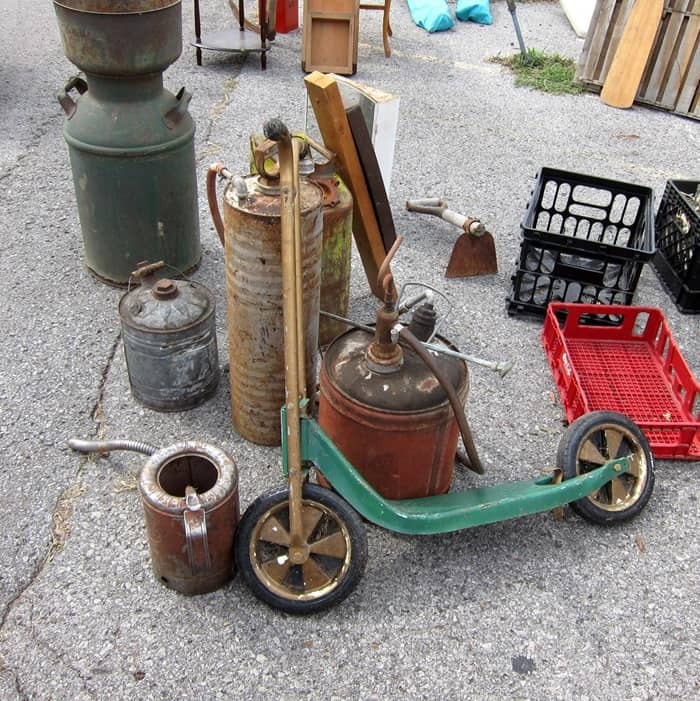 I had so much fun hanging out with you at the flea market. At least I did until I got so hot! So many fun items. Natalie is already saying that she wants to go the the October market so I might get to see you there too. Love all of your finds, especially that coal scuttle. Thanks for the shout out for the shop! Have a great week! Your welcome Angie. We have to do the trip again. Love the orange chair! My favorite! The ice cream bucket is to die for! Gorgeous color! I would also have nabbed the silver plate cup. Yes, the turquoise is beautiful. Your welcome. Thanks for being here! !